So let's see if we can get this going once more, and I'll start with some of my earliest sprites, so be warned, none of them are quite at the quality that I am putting out as of late. Yes, that's right. Balls of yarn. As a good number of characters in the sprite-comics are felines, I decided to make something they could hold in their hands. Small, semi-complex in texture for something that size. A wrench-shaped brand-mark. Nothing else to say about that. Yep, a dog-bowl. Nothing else to see here. And here's where I start up my main pride in my works, weapons and props. This set was made to look like it was 'mass-produced', intended to be used by generic filler-characters or to be used/destroyed on a whim. And this'll conclude this first post. I'll add more if people want to see more. Most of these are from over five years ago, I've got a lot more since then. Keep the spriteworks and more coming! Well, if you want more, TorenZabbic/Wild-Roses on furaffinity is the one I work with and the one I give the sprites to be used in the comic. But I can always add more on here next time I drop a post. This was among a set of items I made that was to have a James Bond gadget meets ritzy accessories. 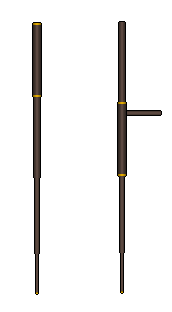 A simple walking cane that turns into a chaqu (or a night-stick as it's more commonly known). 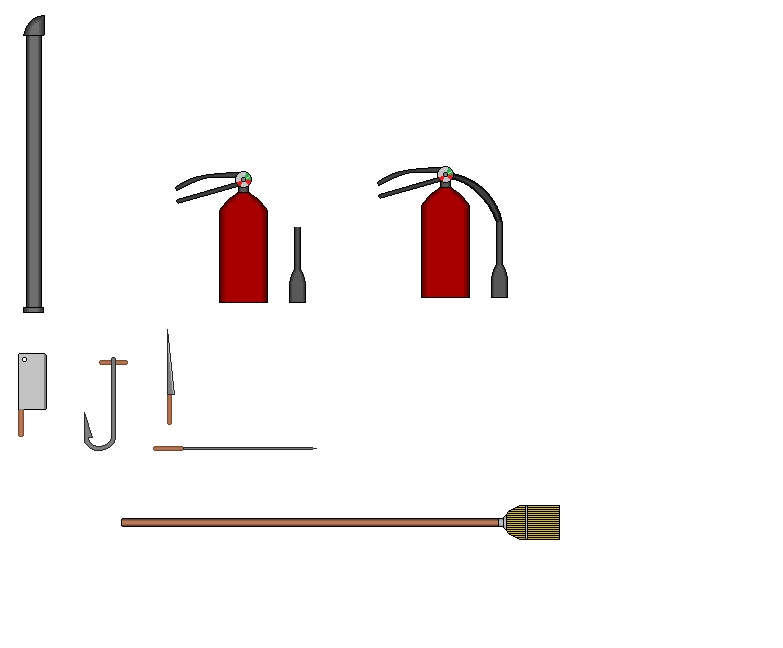 A prop-set for a smithy. As for that odd shape above the coals, that's actually something that would be copied and set over the colder coals section to make it look hotter. This was still into my early-texturing phase. 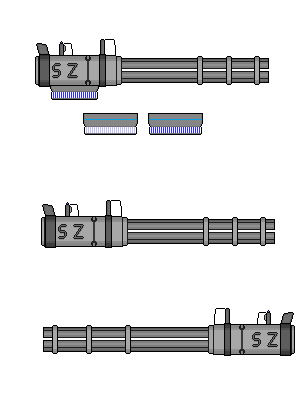 A simple firearm design. Not really one of my better ones. 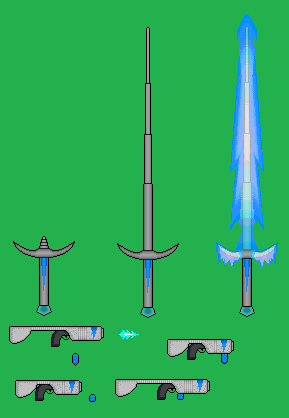 This one was quite a test, but I still lacked the transparent-effect that was needed for it, so it ended up in being more of a collaboration idea, Toren passing the finished product back to me after he added the ice effect to the blade. Well, the idea on this one came about due to a particular livestream chat I was in. Someone said "It's time to fire her!" 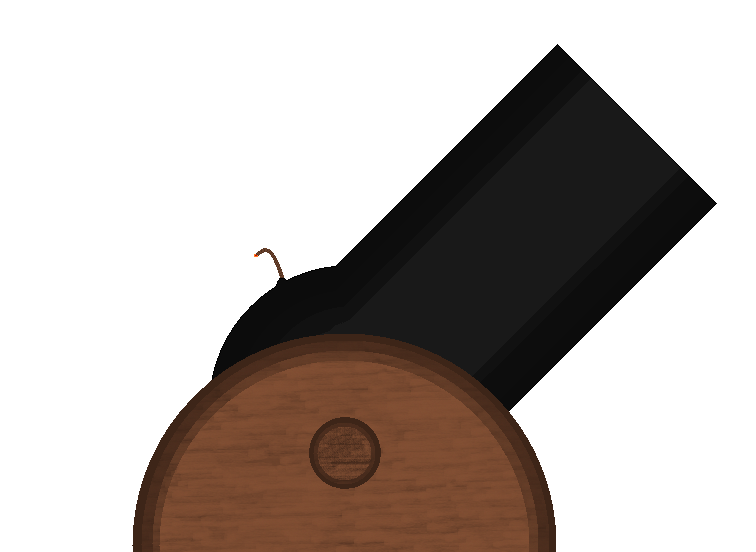 so I said "Out of a cannon?" which sparked this idea. 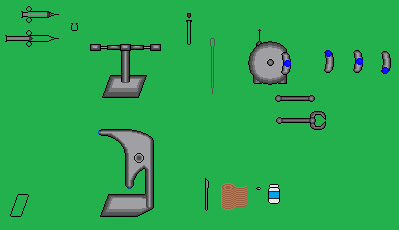 I tried making the wooden support textured to look like grained wood, but again, not my better texturing for sprites. Those of you who might be wondering, yes the staff is a double-ended bladed-trident that can spit apart into two pieces (though I did not make it easy to split apart in this set), and yes, those kris daggers have a button on it. The kris have a venom capsule that seeps the poison onto the blades when the buttons are pressed, though I do not have the concept of that happening made out. 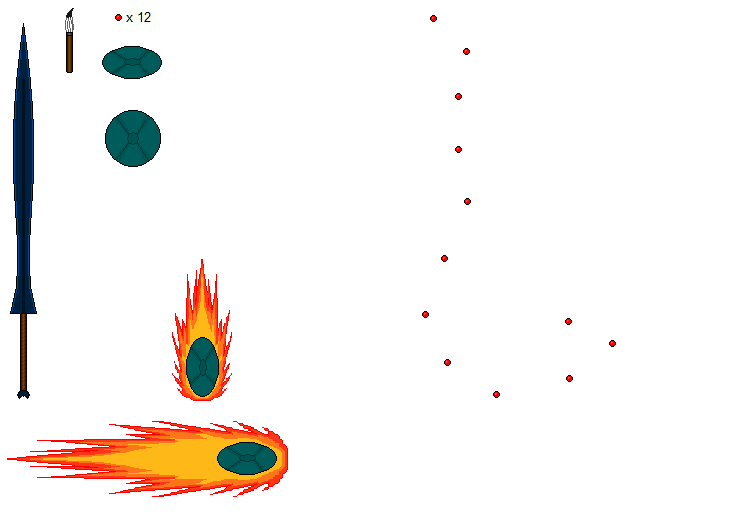 I started alternate-modes/-forms in later sprites though. And some lab equipment for a researcher-medic, complete with a robotic assistant. And I'll end this set right here. I like it all so far, I especially like the cane-weapon idea and the blade with the gun the most! 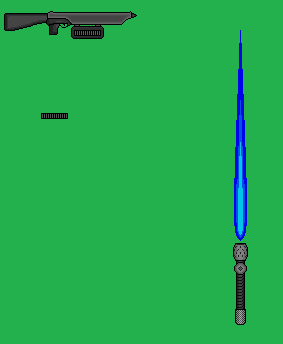 That blade with the gun portion is actually a weapon for a cryo-kinetic character, the sword being a portable refrigeration unit with a telescoping 'blade' for ease of use. The gun kinda acts like a submachine-gun that fires icicles. That actually sounds really interesting. Then my question would be: What would the gun refrigerate? Firing icicles... that sounds creepy and dangerous O_O But very effective. The gun would refrigerate the water (which is in the bottle 'clip') in a manner that causes it to form the icicle shape as it exits the barrel, being supercooled so it freezes in the process. And the character, being a cryokinetic type, would relish in using such a weapon. An odd set considering the character it's meant for. The pistol is a dual-ammunition type, being a flame-thrower and a fire-extinguisher in one body. The bars on the canisters is the amount of 'charge' each ammunition has, the boxes above the pistol is the switch-states to choose which one is actively being used. Also, yes, that is a collapsible harpoon underneath it. 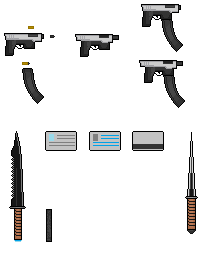 Just some more standard items that might be common among characters and one of my true moments in using 'different state' sprites for the same item. Yes, I re-included one of the mass-produced knives an another throwing-knife in the mix. 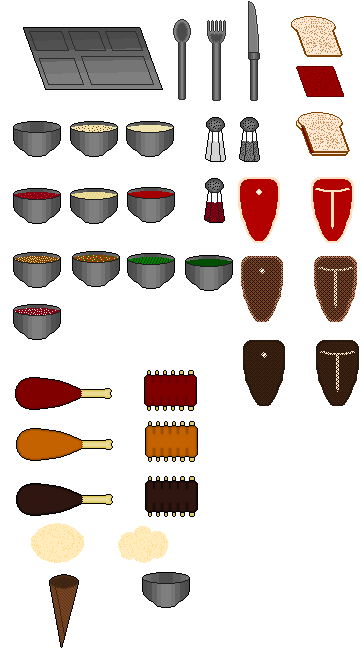 And a big dump of an attempt at food and diner/mess-hall type of items. Another collab-work, having made a scissor-katar with a bit of a plasma edge to it, though I wished I saved the original version as the white portion of the glow would not work very well. I may have to end up redoing this with techniques I've learned recently for plasma glow. Yep, this is the gear that Amaterasu uses in the Okami game, I did this on a whim to see if I could do it, but I think Ammy was even made for use in this comic as a cameo anyways. Before you ask, no, this was not made with Steven Universe in mind. I actually made this before Steven Universe came out and got so popular, but I had to refine the textures quite a bit since then. Now here's one I'm REALLY proud of, my first attempt at a Blue Damascene (Damascus Steel) texture. 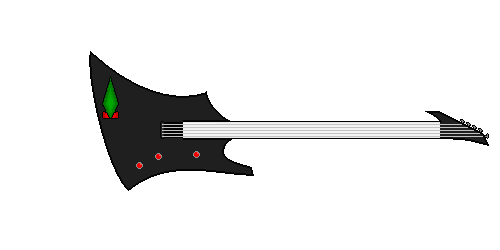 This weapon is actually for one of my characters who now has a role in the comic as well. Yes, that's a scythe with the training padding on it. FISH!!!! Caught and cooked... along with a slice of lime for seasoning. Water lilies and cat-tails. Just some VERY big ones. And that'll conclude this portion of the list. Ah of course, I didn't put two-and-two together with the whole icicle thing .-. Stupid me. Anyways, I can see why you're especially proud of the Damascus steel one. The texture on it is indeed rather well done. On this one, I was trying to teach myself depth and reflection with the pots and the deep-pans, but I don't think I did so well. To be honest, I think these were way too small to be used properly anyways. I group these two together since they're knives for specific characters in the comic, only having minimal visual reference for both of them. Gotta have some way to hold your money, right? Soaps on ropes, scrub brush, bath gels, and a detachable shower-wand for the right side. as for those 'panels', that's sort of a quick air-drying panel, but I had to adjust the skew for it to fit it right in the comic. 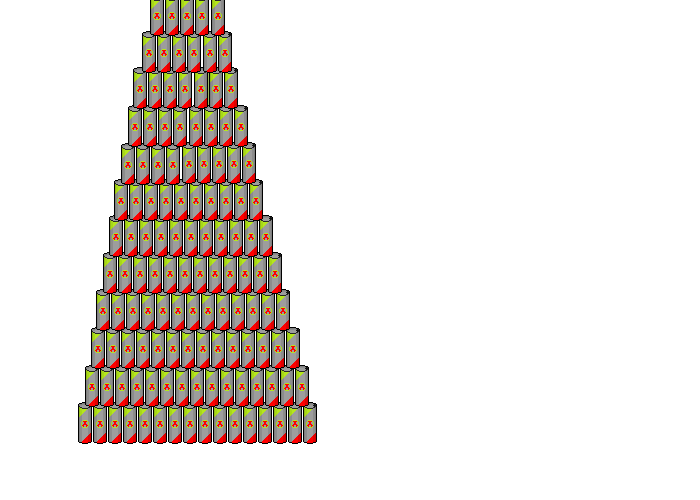 A stockpile of an energy drink I would like to call HYPER! Be careful when giving HYPER! to specific races such as cheetahs. 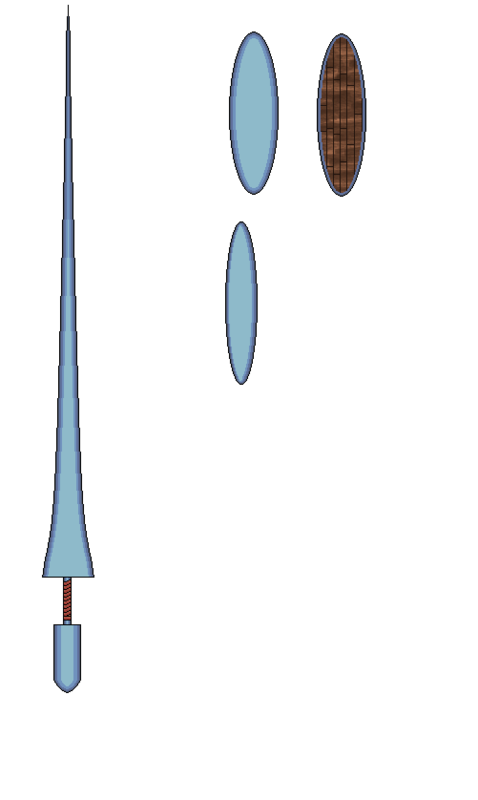 A teleport pad and a teleport beacon. Figure that type of tech would be useful in this comic. Another custom weapon, while it looks like a taser pistol, this one was designed with a Raichu in mind, allowing her to direct her electricity more effectively to a target than having it hit whatever is closest to the source. The one to the right is a revamp on the color-scheme but essentially the same thing, I kept both for reference in case something happened to the original file when I made the mods. Weapons that you'd find as scenery props. Here's an interesting set. 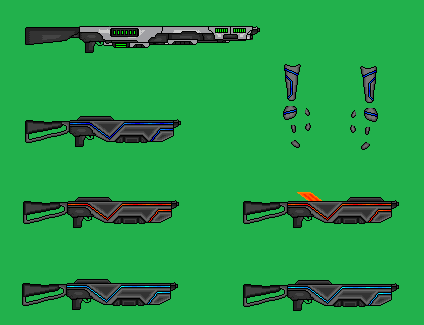 It was designed for a rifle-user in the comic, the top being the "standard" rifle type used in the comic (that portion made by Toren) so I would have something to base my design off of for size, then the bottom five are the states of the carbine. The carbine is actually temperature-regulated and does various effects based on if it gets hot or if it gets cold. 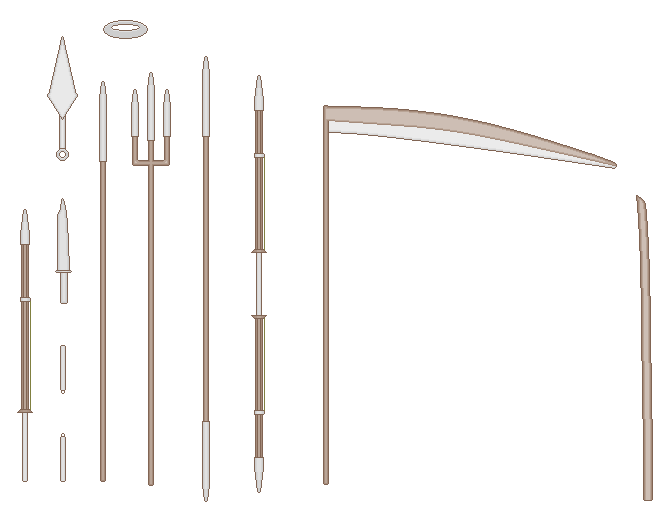 The section in the upper-right are the pieces for the gloves to be worn while using them since the gun gets boiling hot or freezing cold. And that'll be it for this round. 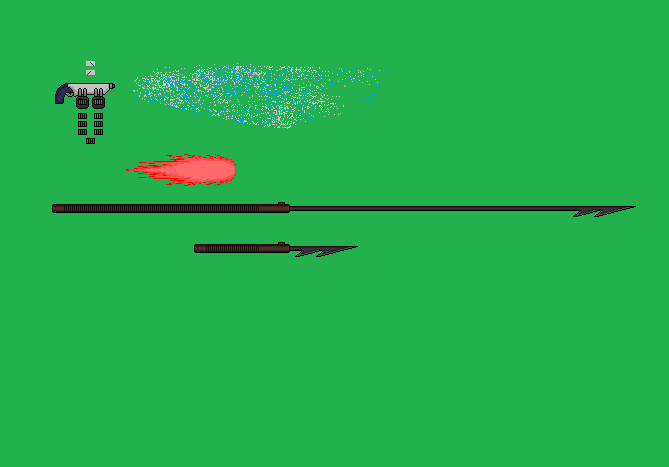 Round 5, and before I continue on, I would like to remind you that these were made in MSPaint almost completely. If I had to use another program or get someone to help, I'll state it in the description. 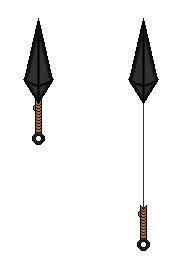 An odd thought, a kunai mixed with a garrote-wire. I guess part of the idea came from the Red Ninja game for the PS2 (the Tetsugen wire weapon used during that game). 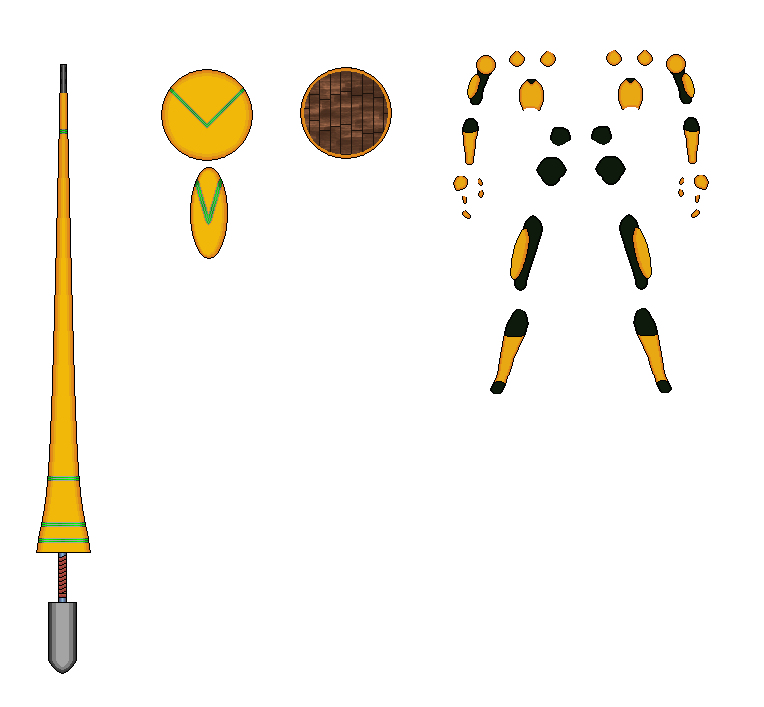 A simple spear-and-lance set for a character, played around with the perspective of the shield to give some different angles. 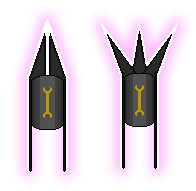 A modified lance-shield-and-armor set, the theory of the armor and the shield having an-able-to-be-toggled electrical field to prevent any unwanted grabs, and as for that spear, it includes a modified rail-gun into the body of it. Yes, character sprites (and the clothing they wear) are disassembled so that any motions can be done without having to redraw EVERYTHING. Yes, that's a minigun/gatling gun. It doesn't use standard ammo, but instead uses energy cartridges that can be quick-dropped for faster reloading. 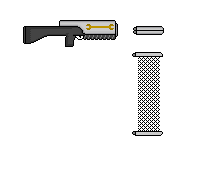 A weapon design for a character that was to have fire-based powers. Those of you who are wondering what's up with the sword and why the blade isn't 'connected', that is a bunsen-burner type of flame coming out of that handle. 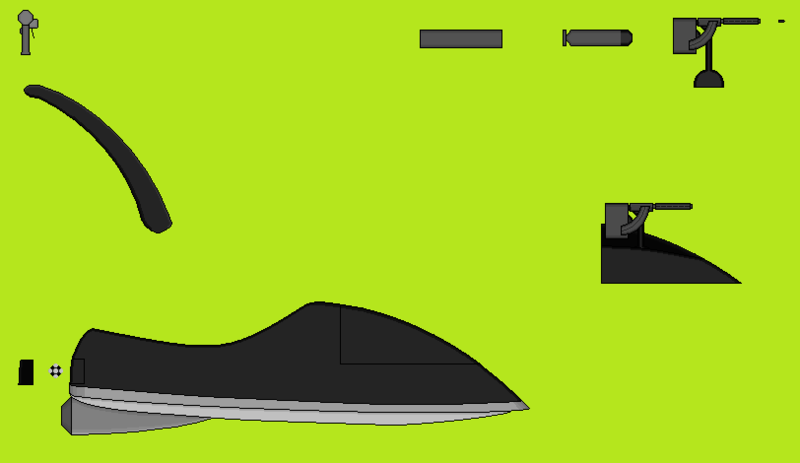 An unarmed and armed jet-ski design I made. The concept of the 'pop-out' weapons actually came from an old show in the 1980's called Airwolf, which also inspired the coloration of the armed one. A worn CB-style radio and a regular walkie-talkie. Cave Johnson would be proud. Dunno why I was inspired to make this one, but I did. And that concludes this round.